The British Churchill Crocodile “flame-thrower” tank was produced from 1943. 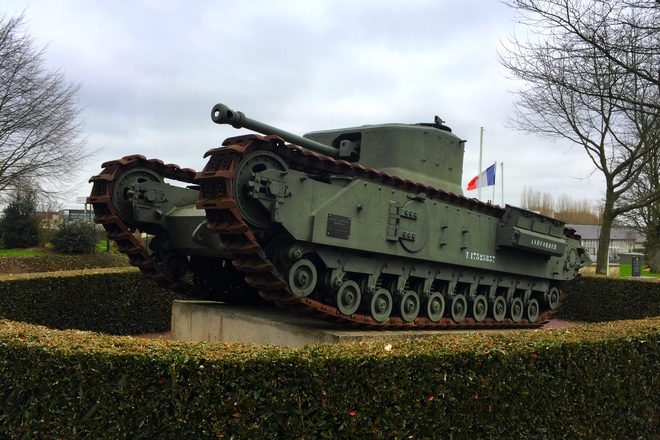 Only 800 were built and the tank was allocated to engineering units, specifically General Hobart’s 79th Armoured Division which was in Normandy from 6 June. The example located outside the Bayeux museum, a rarity nowadays, was found at a scrap merchant’s in Portsmouth in the UK in the early 1980s. Its flame-thrower, with a range of about 120 metres, was mounted in place and in the position of the hull-mounted “Besa” machine gun, leaving the other weaponry mounted on the original tank in place. It towed an armoured trailer (not present) weighing 6.5 tonnes and carrying 1,800 litres of fuel.